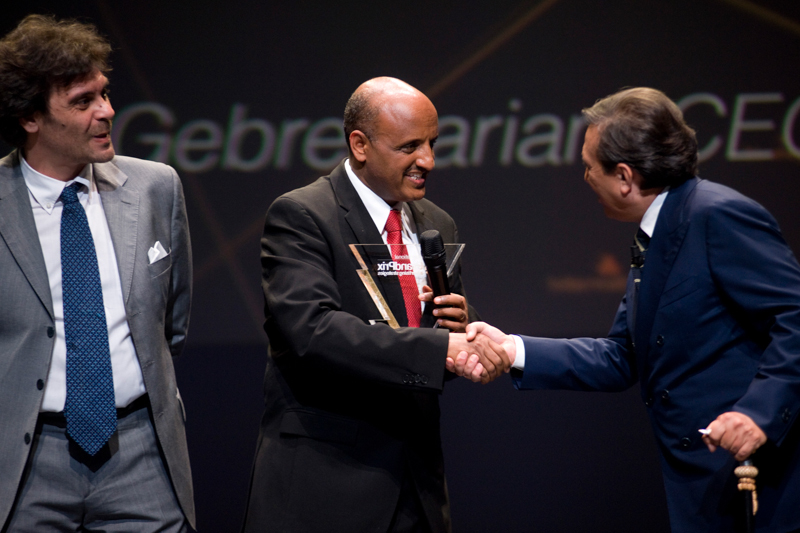 MILAN, 2015-6-11 — /Travel PR News/ — Ethiopian Airlines, the fastest growing and most profitable airline in Africa, is pleased to announce that Ethiopian Airlines Chief Executive Officer Tewolde Gebremariam was awarded the 2015 International Grand Prix special ‪award on Wednesday June 3, 2015 in a ceremony held in Milan. The prestigious award was bestowed upon Mr. Tewolde Gebremariam for his achievements in developing ‪the airline into the foremost aviation group in Africa and for spearheading the transformation of Ethiopian into becoming one of the fastest growing airlines in the world. Under his leadership, Ethiopian continues to add exciting destinations to its fast growing network, making it the only profitable airline in Africa which not only contributes to the socio-economic development of Ethiopia alone but to Africa as a whole. This entry was posted in Airlines, Airports, Flights, Transportation, Travel, Travel Awards, Travel Management, Travel Services, Travelers and tagged 2015 International Grand Prix special award, Airline Business magazine, Ethiopian Airlines, O Tewolde Gebremariam, Planet Africa. Bookmark the permalink.